Glycolysis begins with a molecule of glucose (C6H12O6). Various enzymes are used to break glucose down into two molecules of pyruvate (C3H4O3, basically a glucose molecule broken in half). This process releases a small amount of energy. Glycolysis consists of two distinct phases. In the first part of the glycolysis pathway, energy is used to make adjustments so that the six-carbon sugar molecule can be split evenly into two three-carbon pyruvate molecules. 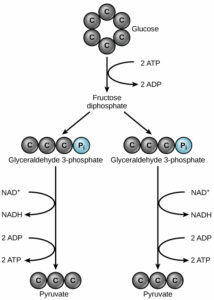 In the second part of glycolysis, ATP and nicotinamide-adenine dinucleotide (NADH) are produced (Figure 2). Figure 2 In glycolysis, a glucose molecule is converted into two pyruvate molecules.